At the International Builder's Show in Orlando this year, green building was an important theme, and it was great to see an architecture firm there lending a helping hand. Alan Mascord Design Associates, a leading home plan design company in Portland, Oregon was at IBS announcing the release of Mascord Efficient Living, a book containing a collection of more than 50 sustainable home plans for builders. The book's stated goal is to help consumers understand that "efficient living" does not mean radically changing your lifestyle. It's more about seriously considering all of the aspects involved in how your house is built. 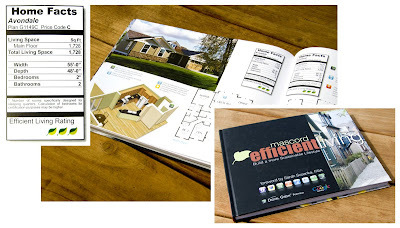 The book presents the designs (all of which were designed to meet the LEED, Energy Star and NAHB National Green Building Standard certification programs) in a clear and engaging manner with a list of "Home Facts" for each. Many of the illustrations in the book were done with SketchUp; the actual construction plans can be purchased directly from the folks at Alan Mascord Design Associates. The book also includes a CD that has the free version of Sketchup and all the models from the book. You can also go to 3D warehouse and find the models, as well as the entire suite of Whirlpool appliances as sketchup models. I'm afraid I'm a little skeptical of designs for efficient, green houses and lifestyles that include three-car garages.